Available on the Great Lawn, Lawn Games is a kit of games and activities for visitors play with on Montalvo’s grounds. Games include old standards like balls and hula-hoops as well as some new amusements designed by artist Miguel Arzabe. The relationship between artists and games has a long history, ranging from Marcel Duchamp’s fascination with chess, to the Surrealists’ use of games like Exquisite corpse, a method by which a collection of words or images are collectively assembled as a source of creative inspiration, to efforts by George Maciunas and Fluxus artists to bring art to mass audiences with their FluxKits and FluxGames of the 60s and 70s. 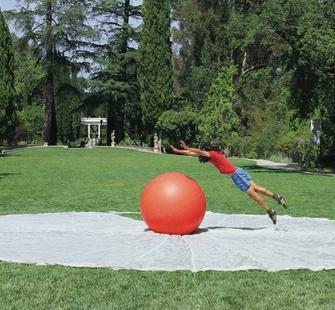 Inspired by the New Games Movement of the 1960s and 70s which sought to replace competitive games with corporative ones, Arzabe selected open ended game equipment like an oversized ball and a large parachute for the Lawn Game Box. He also produced a series of interactive games that provide visitors with new and unexpected ways to explore the property. The Lawn Games box is designed by industrial designer Benjamin Laramie in collaboration with visual artist Leah Rosenberg. The box was developed in conversation with their collaborative work for BAN7 at the Yerba Buena Center for the Arts.